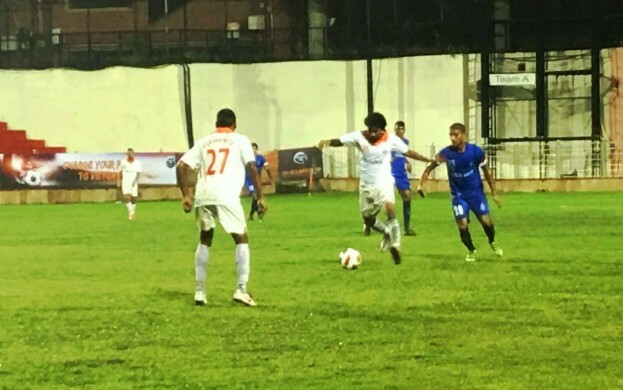 Sporting Clube de Goa shared a point with Indian Navy in the second fixture of Durand Cup 2016 held at Ambedkar Stadium, New Delhi. .. Sporting took the lead through a towering header from their ace defender Loveday Enyinnaya (21'), while Indian Navy equalized in the 69th minute through a free kick from the edge of the box. The kick-off was delayed over 40 minutes due to heavy rains that lashed the Capital city. Even-though the ground conditions were not at its best both teams decided to go ahead with the match after a brief inspection of the playing surface. Both teams started off cautiously restricting play to the midfield. The first goal-mouth action came way past the first quarter when Victorino Fernandes made a dazzling run beating his marker. Sporting were the first to score through a corner kick when the ace defender Loveday Enyinnaya launched himself into the air to strike a powerful header giving Sporting the lead in the 21st minute. After the first goal Indian Navy tried their best to get into the game but the defensive partnership between Loveday and Clemente Joseph gave very little room for the opponents to operate, while their long range efforts were easy pickings for Ravi Kumar. The score stayed 1 - 0 in the half-time. Indian Navy came out all guns blazing in the second half, but couldn't break the Sporting defence from open play. In the 69th minute Indian Navy won a free kick which was converted putting things on level terms. The final 20 minutes saw Sporting throw everything they have into the match but couldn't break down the defensive approach of the Indian Navy. With this draw Sporting have collected 1 point from two matches played.